The Bodleian Libraries’ Special Collections are a treasure trove of archives, manuscripts, rare books, printed ephemera, maps and music, which date from the present day back to ancient and classical antiquity, and many were created by or of importance to LGBTQ+ people. Some of the oldest items are 2nd century papyrus fragments of the poetry of Sappho of Lesbos. A few hundred years later, you will find the 1682 proceedings to nullify the marriage of the musician Arabella Hunt and her husband James Howard, who turned out to be a woman called Amy Poulter [MS. Rawlinson B. 378, fols. 259-67]. 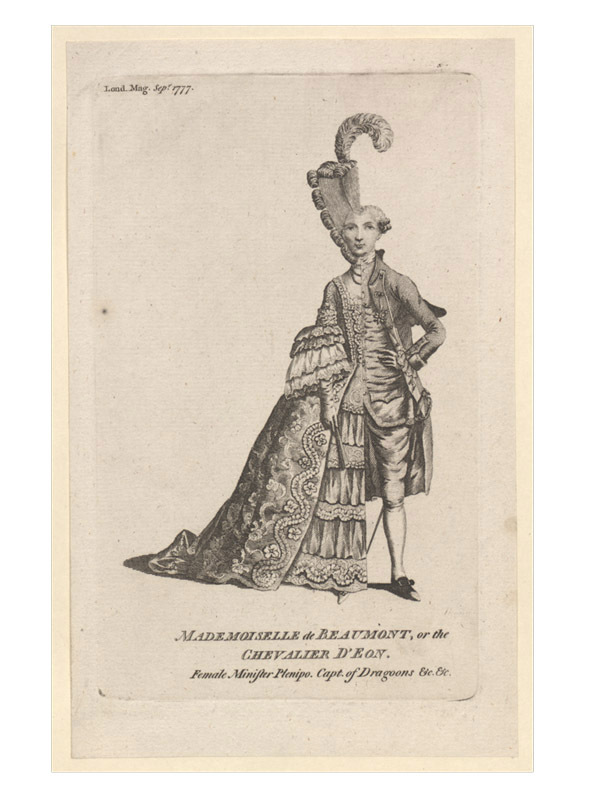 There is more on cross-dressing in the John Johnson Collection of Printed Ephemera, including images of the Chevalier d’Éon (1728-1810), who presented as both a man and a woman throughout a complicated and intrepid life as a diplomat and spy. The literary archives include a number of queer writers, like William Beckford, one of the richest men in 18th century England, who exiled himself to the continent after he was found in compromising circumstances with William Courtenay, “one of the most beautiful boys in England” [MSS. Beckford]. Or how about the papers of Wilfred Owen, a leading poet of the First World War, or the archive of Stephen Spender [MSS. Spender], a friend of WH Auden and Christopher Isherwood? Less well known is Ivor Treby [MSS. Treby], a founding member of the Gay Authors’ Workshop, who spent years researching the Victorian poet ‘Michael Field’, which was the nom de plume of two (lesbian?) women (the Library houses many Michael Field papers too!). There is plenty to find in the political and scientific collections as well, including the archive of computer scientist Christopher Strachey, a friend of Alan Turing [MS. Eng. misc. b. 248-302]; the archive of Roy Jenkins, the Labour Party Home Secretary who oversaw the 1967 partial decriminalisation of homosexuality in England and Wales [MSS. Roy Jenkins]; and also the archive of the Conservative Party, if you want to see how attitudes have changed over the years. And this is all just the tip of the iceberg! There is plenty more to see. Some of the finest manuscripts can be seen in the free-to-visit Treasury Gallery in the Weston Library and online at http://treasures.bodleian.ox.ac.uk. You are also welcome to do your own research in the Weston. For more information, including how to get a reader’s card (free for Weston Library researchers), please see the website at www.bodleian.ox.ac.uk/weston. When Queen Elizabeth I died in 1603, her cousin King James VI of Scotland (1566-1625) inherited and united their crowns. 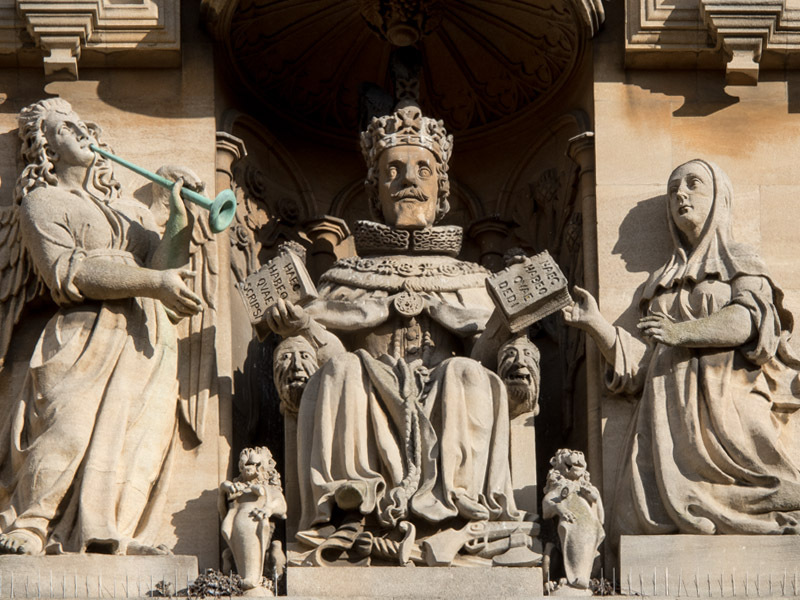 He is usually known as ‘King James VI and I’, joining two countries which had often been at war, as well as becoming the sovereign of Ireland, already under English rule. He was still on the throne when this building, the Schools Quadrangle, was completed in 1624. James had become King of Scotland at just 13 months old. In 1589 he married Anna, the 14 year old daughter of the King of Denmark. They were a happy couple and had five children, but from his teens James also had a succession of male ‘favourites’, particularly George Villiers, who rose rapidly in James’s court and affections. In 1617 James said “he loved the Earl of Buckingham more than any other man”. Although the boundaries between political influence, male intimacy and sexual relations are difficult to untangle in this period, when men sharing beds was common, it is notable that in some of James’s houses there are concealed doors or passages linking the King’s bedchamber with others. Peter S. Forsaith, Ph.D., F.R.Hist.S.